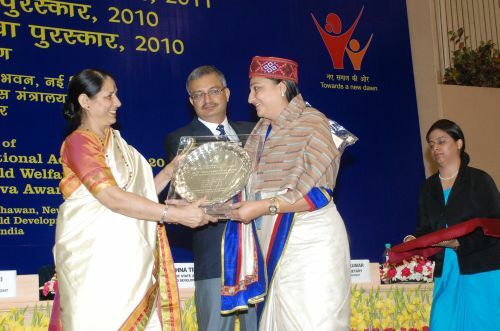 Himachal based NGO Chetna Founder President Dr Mallika Nadda was commemorated with Rajiv Gandhi Manav Sewa Award 2010 by Union minister of women and child development Krishna Tirth in a national level function held in Vigyan Bhawan New Delhi today for her services to differently abled children in the Bilaspur district of Himachal Pradesh. 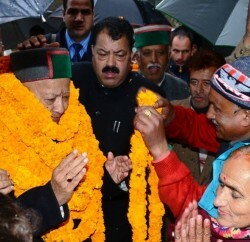 She has been given award to introduce social integration of differently abled children through sports. Dr. Mallika Nadda Founder President of the NGO Chetna started community based rehabilitation programmes initially with 10 panchayats of Bilaspur district which has been extended to all 151 panchayats of the whole district. 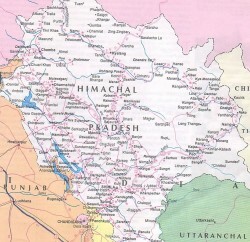 The NGO Chetna presently caters to 448 disabled persons in the Bilaspur district and organizes medical and health awareness camps in the rural areas of the districts. Chetna has motivated rural women to form Self Help Group for their economic upliftment and financial independence as part of Income generation Programme and so far 50 SHGs are formed and are working with great enthusiasm in entire district.